... because today the cataracts, deafness, lameness, heart arrhythmia and fluid on the lungs finally all reached critical mass and dear old Fudge departed this life at the vet's, two days after Toby. She'd been on borrowed time for ages - you could even say for years, if you factor in the time she chewed through a live cable, the time she was hit by a car, and the several times she OD'd on stolen chocolate, including helping herself to an unguarded almost full carton of charity chocolate bars. She bounced back every time, unfazed, appetite intact, wondering what all the fuss was about. She was a beauty in her day, talent-spotted for a dogfood label, the photo-shoot set up in the garage, the main prop her treasured dinner bowl. 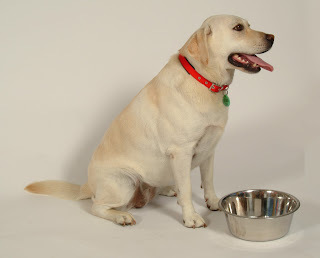 It's the great Labrador tragedy, that they need so little food and inhale it in seconds, leaving a whole 23 hours and 59 minutes to wait till the next feed. I made sure she left this life with the fullest stomach she's ever had - chocolate binge excepted. RIP, Fudge. A double loss! So sad. Thank you. Yes, it really, really is. Knowing it was coming up hasn't helped one bit.